Are you stumped by Christmas? No idea what to give anyone? Fed up with over-consumption and angry about the crazy cost of accommodation (Hastings’ propery prices rose by 12% in 2016)? 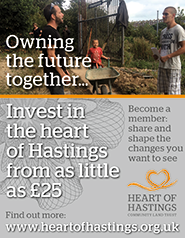 Then think about giving a little bit of heart this Christmas by buying your loved one a share in the Heart of Hastings Community Land Trust. HOT’s Erica Smith is proud to be an early adopting shareholder. 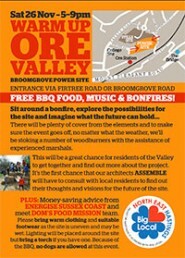 For over 40 years the old Broomgrove Power Station site has been left empty and derelict, but in September 2016 the Heart of Hastings Community Land Trust was given a licence on the land to start working with local people to design and create a new kind of development from the bottom up. Erica Smith talks to Jess Steele and others from the Heart of Hastings about the project.